JAN 4 – Enero Zapatista 2019 Opening: Join us for the first event of Enero Zapatista 2019. The event is free and will feature a panel discussion. Pastries, coffee and snacks for children will be provided. Vegan food available for purchase. World Beat Center, 2100 Park Blvd, San Diego, CA. 5:30 – 9:00p. CHANGES TO CALENDAR: FIOB event on 1/18 has been cancelled and Hormigas event on 1/19 has location TBA due to upcoming tour of the Congreso Indigena de Gobierno. JAN 24 – Environmental Justice and Decolonization: As a settler-colonial nation, the United States occupies indigenous land and it continues to seize/pollute native land and water, as seen through the Dakota Access Pipeline violence at Standing Rock in 2016-2017 – one of the many examples of settler violence. Land/water/air/fire justice is crucial for decolonization and for the defense and repatriation of indigenous land and life. Zapatista autonomy has shown us that land, water, and life are intimately connected and must be protected and renewed. How do we take these lessons into our own movements? By focusing on indigenous and POC activism, we will discuss the possibilities and limits of environmental justice struggles locally and globally, including: San Diego-Tijuana border pollution & toxicity, Los Angeles/Bay Area activism, and South American anti-colonial struggles for water. 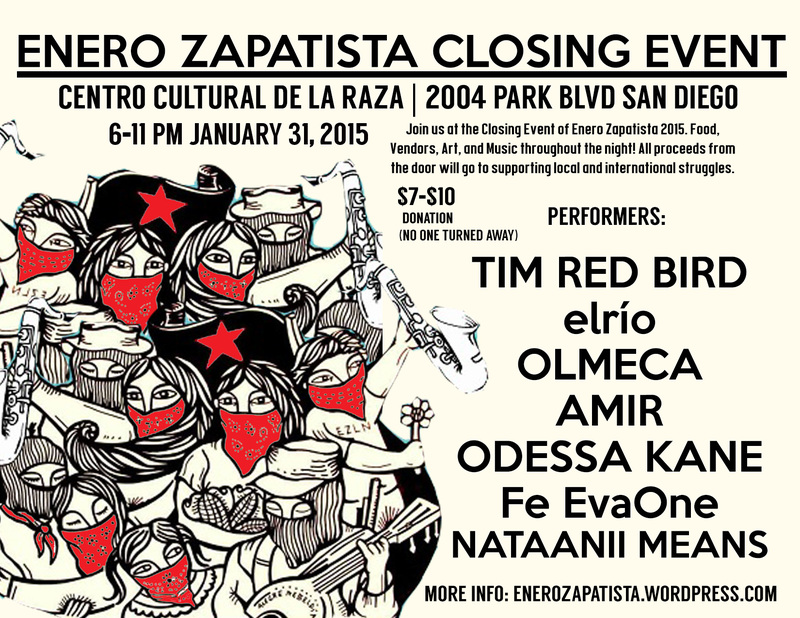 This is the last event of Enero Zapatista 2015. There will be performances, art, vendors, food and more! $7-10 donation is requested, although no one will be turned away. All funds raised will go to supporting indigenous struggles in Mexico and the Casa De Cultura Obrera. Come join us for this celebration of resistance from below!